Eritrea is a difficult country to define. Although in Africa, it doesn’t feel wholly African. While its broad shore faces the Middle East, it is not overtly Arabian. And though its capital evokes the spirit of Europe, it is far from European. For such a small country, Eritrea offers an astonishing variety and it tends to attract a motley crew of visitors: from archaeologists to architects; scholars to scuba divers; historians to hikers; and cyclists to steam railway buffs. While there are many reasons to come to Eritrea, there is one impression that endures when you leave: the remarkable kindliness of the Eritrean people. Making friends here is an unavoidable pleasure and one that touches the lives of so many visitors. The country stretches along the Red Sea and is low-lying in the eastern coastal regions and western border with Sudan, with a precipitous mountainous interior rising to a majestic 2,500m (8200ft) above sea level. Having been colonised in part by the Turks and Egyptians, Eritrea took on a European flavor with the arrival of the Italians in 1885 during their belated entry in the “scramble for Africa”. The legacies of successive foreign forces, combined with a rich mix of nine local ethnic groups have created a diverse cultural landscape that offers the best of African, Middle Eastern and European influences. 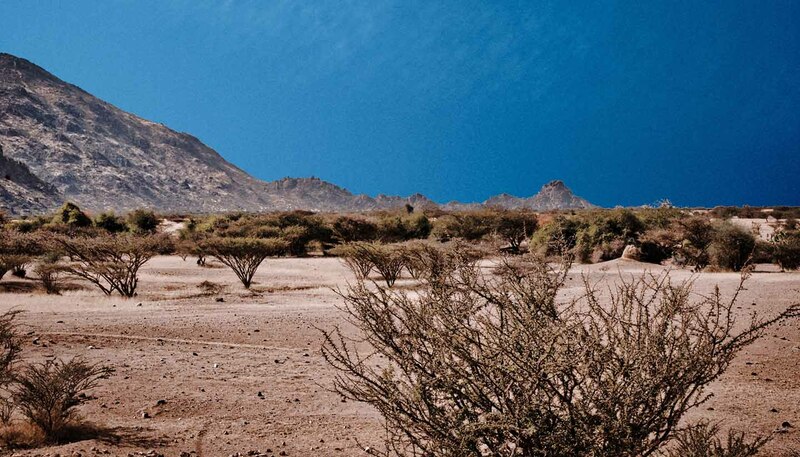 Eritrea also boasts an abundance of historical and natural attractions. The colonial and modernist architecture of its towns and cities is as stunning and startling as the wildlife that populates its mountainous escarpments, deserts and coastline. Elephants, lions, baboons, gazelles, leopards, ostriches, turtles, dugongs and some of the continent’s rarest birds can all be found here. And with a coastline extending nearly 1,000km (621miles) along the Red Sea, Eritrea offers some of the best diving and snorkelling in the world, as well as the most secluded beaches. Once you’ve experienced Eritrea’s many secrets – travelled across its mountains and deserts, swam off its coastline, and met its warm people – it will only be a matter of time until you return for more. 117,600 sq km (45,405 sq miles). President Isaias Afewerki since 1993. The FCO advise against all travel within 25km of Eritrea’s land borders, with the exceptions of: the towns of Senafe and Tessenei; the border crossings at Debay Sima – Burre, Serha – Zalambessa and Kesadika (Adi Kuala) – Rama, plus the main paved roads leading to those crossings (as displayed on the map). The Eritrean authorities consider all British nationals holding either Eritrean or PFDJ identity documents (including out of date documents) as Eritrean nationals. Five British nationals were provided with consular assistance in Eritrea in 2017. Consular support is severely limited in parts of Eritrea. Constraints on travel within Eritrea means the British Embassy in Asmara is unable to offer consular assistance to British nationals outside the greater Asmara area. The British Embassy is unable to offer consular assistance to dual nationals in Eritrea. Although there’s no recent history of terrorism in Eritrea, attacks can’t be ruled out. There have been increased incidences of criminality have increased in recent months - take sensible precautions with your personal safety. Don’t walk around late at night alone. Keep valuables, particularly cameras and passports, out of sight. Keep a photocopy of the personal details page of your passport in a safe place, or with friends or family in the UK. A large proportion of the population has access to arms under the government of Eritrea’s civilian militia programme. We have no evidence that these weapons increase the threat of violent crime. There are extensive mine fields in Eritrea, especially in border areas. Driving on main roads away from border areas is generally safe. The FCO advise against all travel within 25km of Eritrea’s border with Ethiopia, with the exception of the town of Senafe, the border crossings at Debay Sima – Burre, Serha – Zalambessa and Kesadika (Adi Kuala) – Rama, plus the main paved roads leading to those crossings. There are reports that some crossings have been completely or partially closed - travellers should check local advice before proceeding to the border. A further crossing at Omhager ER – Humera ETH was opened on 7 January. Avoid driving on non-metalled roads and walking or hiking in the countryside. In September 2011, a landmine exploded on the road between Senafe and Afoma, to the east of Senafe, killing 5 people. The FCO advise against all travel within 25 km of Eritrea’s border with Djibouti. In 2008 there was fighting between Djibouti and Eritrea after an incursion of Eritrean forces into the disputed Djibouti border region. Though relations have improved, the situation remains unresolved. The FCO advise against all travel to Eritrea’s border with Sudan, with the exception of the road to, and main town of Tessenei. There are ongoing reports of armed groups operating in and around the border area. Avoid travelling after dark in rural areas. Road signage and barriers are scarce, and steep drops are common. In many parts of the country roads are difficult or impassable during the rainy season. Due to the proximity of the Hanish islands in the Red Sea to the ongoing conflict in Yemen, it’s highly unlikely permission would be granted to visit the south western Hanish islands that belong to Eritrea. Telephone networks are often unreliable and may only work for limited periods each day outside Asmara and larger towns. There are no agreements between Eritrean mobile telephone providers and international providers. You will not be able to receive or send calls or SMS text messages from any overseas mobile phone network on arrival in Eritrea. Local SIM cards can’t be purchased without a resident’s permit. There have been unconfirmed reports that phone calls made on the local mobile phone network are recorded. All electronic items (laptops, mobile phones, cameras etc) should be declared upon arrival. Failure to do so may result in their confiscation by Eritrean customs officials when you depart. All foreign nationals must apply in advance for a travel permit to leave Asmara and the surrounding province of zoba Maekel. There are checkpoints outside of Asmara where your travel permit will be checked. Those working outside Asmara also need a travel permit to leave their area of residence or work. Applications in Asmara are handled by the relevant Ministry. For business travellers, applications are dealt with by the Ministry of Trade and Industry. Applications outside Asmara are handled by the local Zoba (Region) Administration Offices. Permission may take several days to be granted and is sometimes refused or delayed. Tourists wishing to travel outside Asmara should apply for a travel permit at the Ministry of Tourism located on Harnet Avenue in Asmara. Processing usually takes around 24 hours. When applying for permission to travel outside of Asmara, you should supply details of the car you’ll be travelling in. There have been reports of tourists not being permitted to use public transport to travel outside of Asmara and having to rent a car or use a private taxi. Restrictions on travel by foreign nationals apply equally to foreign diplomats. Staff from the British Embassy therefore can’t provide consular assistance to British nationals outside Asmara. Mariners must seek permissions and entry visas before attempting to land in Eritrea. Recent piracy attacks off the coast of Somalia and in the Gulf of Aden, highlight that the threat of piracy related activity and armed robbery in the Gulf of Aden and Indian Ocean remains significant. Reports of attacks on local fishing dhows in the area around the Gulf of Aden and Horn of Africa continue. The combined threat assessment of the international Naval Counter Piracy Forces remains that all sailing yachts under their own passage should remain out of the designated High Risk Area or face the risk of being hijacked and held hostage for ransom. For more information and advice, see our Piracy and armed robbery at sea page. Consular support is severely limited in parts of Eritrea. Constraints on travel within Eritrea means the British Embassy in Asmara is unable to offer consular assistance to British nationals outside the greater Asmara area. The British Embassy is unable to offer consular assistance to dual nationals in Eritrea. There are obstacles to the provision of consular assistance even in Asmara. The Eritrean authorities may not inform the relevant Embassy if a foreign national is in need of help and there have been recent instances where the Eritrean authorities have refused consular access to detained foreign nationals. Be vigilant at all times, especially in crowded areas and public places like transport hubs, hotels, restaurants and bars and during major gatherings like sporting or religious events. Previous terrorist attacks in the region have targeted places where football matches are being viewed. Photographing government buildings and military installations is not allowed. If in doubt, ask first. You need a permit to take photographs of the ‘tank graveyard’ in Asmara. You can apply for one at the Ministry of Tourism. Dress modestly, especially in lowland and predominantly Muslim areas. Shorts and T-shirts are likely to draw attention. Homosexual behaviour is illegal, although the penalties are unclear. Be discreet. See our information and advice page for the LGBT community before you travel. You need a visa to enter Eritrea. Visa applications can take a significant amount of time to process, so you should plan well ahead. Make sure any necessary travel documents including exit visas remain valid for the duration of your stay. The Eritrean authorities take breaches of immigration laws seriously and travellers who have overstayed can face lengthy delays regularising their position before departure, or even detention. Entry stamps are not being issued at the newly re-opened land-border crossings from Ethiopia. Onward travel from Eritrea by air is not being permitted without a valid entry stamp. If you enter Eritrea by road from Ethiopia, the immigration authorities will require you to depart the same way. Your passport should be valid for a minimum period of six months from the date of entry to Eritrea and have at least two clear pages adjoining one another in your passport. Dual British/Eritrean nationals entering Eritrea will be classed as Eritrean nationals by the Eritrean authorities. The British Embassy is unable to gain consular access to, or obtain information on dual nationals if detained by the authorities or otherwise in need of assistance. Dual nationals entering Eritrea on an Eritrean identity card rather than an Eritrean passport will need an exit visa from the Immigration Office in Asmara to leave the country. Foreign visitors must declare all foreign currency over 10,000 US dollars or equivalent on entering the country. There is no limit on the amount that can be brought in. Make sure you have had your completed foreign currency declaration form approved and stamped before you leave the airport. If you declared currency on arrival, when you leave you will have to show that any foreign currency missing was exchanged at a branch of ’Himbol’, the State foreign currency exchange. If you spend any US dollars at an official hotel you must get a receipt to present along with the currency declaration form when you leave the country. You’re not permitted to take more than 500 nafka (ERN) out of Eritrea. If you fail to comply with these regulations you may face prosecution leading to a heavy fine, as well as a delay to your departure. UK Emergency Travel Documents are accepted for entry, airside transit and exit from Eritrea. You’re not permitted to take more than 500 Nafka (ERN) out of Eritrea. Under 18’s aren’t entitled to hold any amount of Nakfa. If you’re exiting Eritrea and you hold in excess of the 500 maximum limit, it will be confiscated and where the amount exceeds ERN 5,000 you may face prosecution leading to a heavy fine, as well as a delay to your departure. The economy is completely cash-based. There are no credit card or ATMs facilities in Eritrea. You’ll need to pay for everything in cash. Most hotels in Eritrea will require you to settle your hotel bill in US Dollars. It’s illegal to use foreign currency to make purchases except at a limited number of officially-recognised hotels. You should get a receipt for any such purchases. The currency in Eritrea is the Nakfa. Nakfa aren’t convertible outside Eritrea. You should convert any excess Nakfa back to hard currency at one of the ’Himbol’ exchanges in town, as there are limits to what can be converted at the ’Himbol’ branch at the airport. You will need the original currency transaction receipt. The Nakfa is currently pegged at the rate of 15 Nakfa to one US dollar. There are three public hospitals in Asmara. Public hospitals in other towns are often poorly equipped. Elsewhere medical facilities are even more limited. If you’re travelling away from the large towns, carry a comprehensive medical pack with you. If you’re taking prescription medicines, you should make sure that you have a sufficient supply for the length of your stay in Eritrea. If you need emergency medical assistance during your trip, dial 122244 and ask for an ambulance. You should contact your insurance/medical assistance company promptly if you are referred to a medical facility for treatment.